If you've followed TinkerTry for a while, you'll note that I'm a bit of an LED bulb fiend. 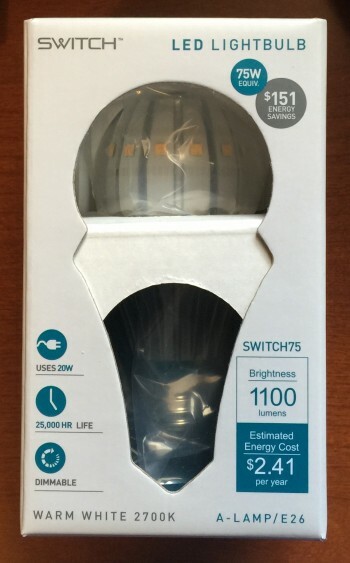 Always on the lookout for an efficient 60 or 75 watt equivalent A19 bulb that has a CRI of 90 or above, a color temperature between 2700K and 2900K, and a price below $10. Yeah, I know, it's a tall order, but I won't go "all in" for the rest of my home's fixtures until these needs are met, having tried and returned a number of contenders. In this multi-year quest, I've tried a number of brands, seen at TinkerTry.com/?s="led+bulb" , and many have worked out great, giving me lots of light, and very little extra heat, including the 3 bulb ceiling fixture in my compact home office space, and several other spots in my home. I have also learned I don't tolerate anything below CRI 90 very well, but that's just me. Switch's website is no longer available (hasn't been for months) and a customer service phone number has been disconnected for about as long. Customer and distributor complaints on forums claim that the bulbs are no longer available from a variety of stores, though there's some inventory still available via resellers on Amazon. So, what do I do? 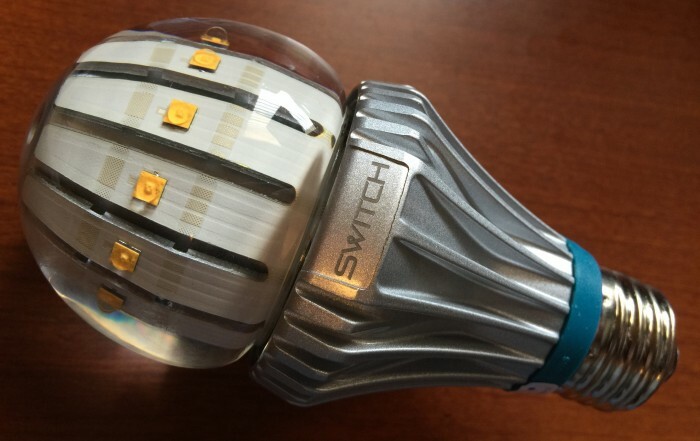 While it's disappointing this innovative approach didn't work out for this company, for me, it's a minor setback, and the hunt continues for LED bulbs that can handle completely enclosed fixtures. You'll see I posted appropriate updates to my Replacing your 60 watt bulb with the Cree TW Series LED, is it a bright idea? article, with my Switch Infinia experience detailed, including my last purchase of one of the few 75 watt equivalents left in stock at Amazon here that'll be used in an enclosed fixture, behind frosted glass. I realize I have no lifetime warranty. See also several LED bulbs that have been recalled here. Note that I've also contacted Richard Gunther of the Home: On Podcast, who will be doing an update on Switch Lighting for his audience soon. Did you experience fluid leaking from your Switch Infinia bulb? Please drop your responses below, no login required! On air mention, how nice of Richard, 2 minutes into the latest Home: On #044 – The Ultimate Home, with Chad Thompson, mentioning the above news about Switch. As usual, a great home automation episode!